WHO: Denzil Porter, rapper from the Bronx, New York. Rappers Saigon, ALBe Back, Willie Evens Jr., LIL SNS, Kid Daytona, Timeless Truth and Fresh Daily will also be performing. Music will be by DJ Gyvis and DJ SNS and hosted by Chuck Creekmur and Sucio Smash. Photography and interviews will be by BlogXilla of Global Grind. 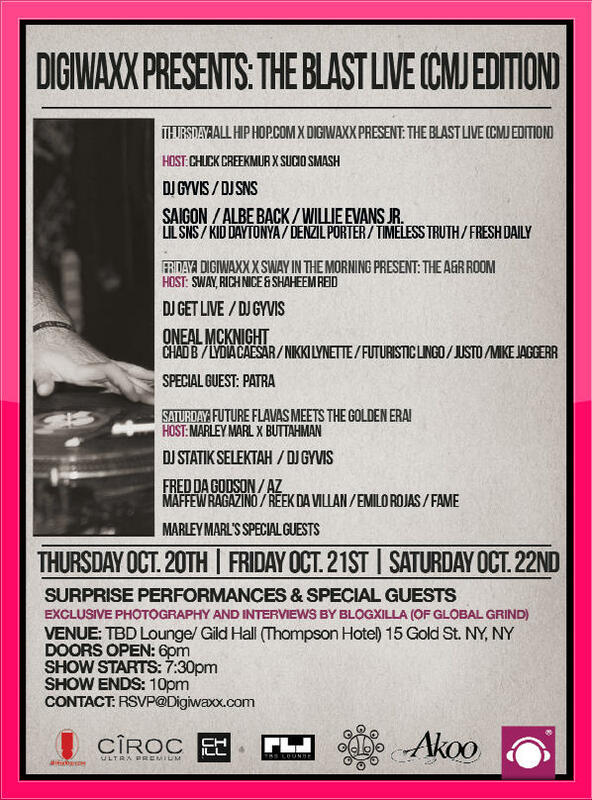 WHAT: Denzil Porter will be performing at The Blast Live (CMJ Edition) presented by Digiwaxx. WHERE: The show will be held at TBD Lounge/Gild Hall in the Thompson Hotel on 15 Gold St. New York, NY. WHEN: Thursday October 20, 2011. Doors open at 6PM, show starts at 7:30PM and show ends at 10PM. CONTACT: Please R.S.V.P. to RSVP@DIGIWAXX.COM. For media inquiries please contact Jeunesse Yvonne via phone or email at 917-596-6174 or JeunesseYvonne@gmail.com. For all other inquiries, please contact Denzil Porter’s manager, Mandell Conway at 347-835-1871 or MannyForbes@gmail.com. For more information on Denzil Porter please visit www.DenzilPorter.com.